Turn your backsplash into a work of art by opting for tile that packs a stylish punch. Be it hexagons, penny rounds, or a dimensional wall tile, there are plenty of mod-friendly tile options for your mid century kitchen. 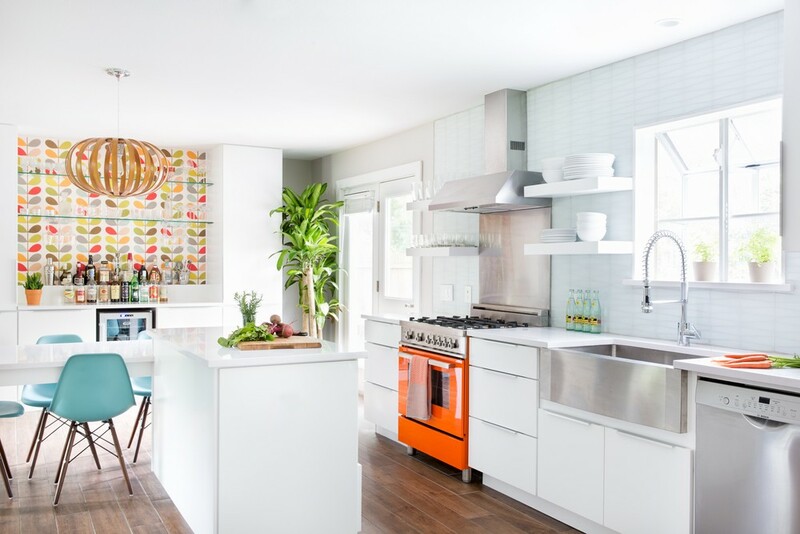 It’s no secret that fun colors played a key role in mid century kitchen design. From pink stoves to blue refrigerators, bold use of color is as at home in a mid mod kitchen as the cabinets themselves. Are colorful major appliances not your style? Consider a splashy tile hue, paint an accent wall or opt for bright cabinets. Starbursts, and diamonds, and boomerangs—oh my! The mid century brought us a plethora of amazing graphic patterns. Bring their retro goodness to your kitchen through dish towels, linen napkins, or wallpaper. Make it Mid Century has SparkleLam. Yes, you read that right—sparkly laminate countertops! Glistening with flecks of gold or silver and available in 15 colors, having a Jetson’s-inspired kitchen has never been easier. 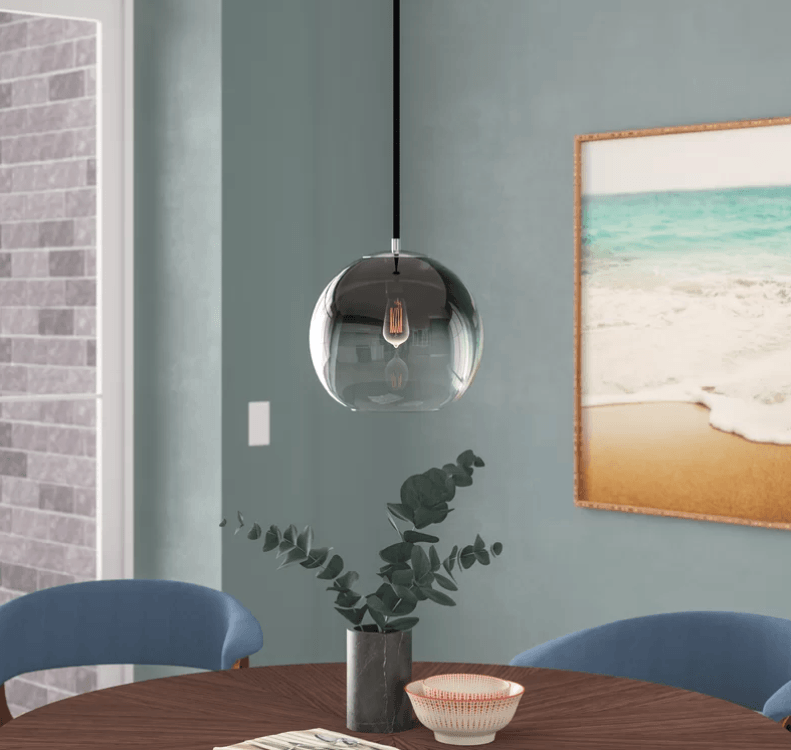 Bold hues like orange and turquoise often get all the attention from fans of mid century design, but soft hues like buttery yellow, mint green and soft blue are just as period appropriate. If a lighter kitchen palette is more your speed these are the colors for you. Be it your island, a bank of open shelves, or a vintage stove—pick one area and play it up. Having a focal point will anchor your kitchen’s design and help create a lasting (and decidedly mid century) impression. Don’t overestimate the power of good lighting. Take your time choosing pieces that marry form and function so that your mid century kitchen will have stylish fixtures as well as plenty of light. A cluttered counter is never a good idea, especially in a mid century kitchen. Finish off your space with a few well-placed accents that nod to retro style without overwhelming the eye. Display a vintage cookbook, salt and pepper set, or add a collection of mid mod glasses to open shelves. Don’t forget, this kitchen is yours. Does red make you happy? Use it. Is that vintage art print what you want to look at while making coffee? Hang it up. Are your mom’s mixing bowls worthy of display? Set them out. A well-designed and perfectly styled kitchen isn’t complete until it features the people who use it. Only craftsman style truly rivals the mid century in appreciation for and celebration of woodgrain, so play up your wood cabinets by choosing a palette that lets them be the star of the show. If you’re starting fresh with your mid century kitchen design, look for easily customizable cabinets. Be it a Gorge Nelson clock, a vintage art print, or a display of retro mugs—a mid century kitchen isn’t complete without a few proudly displayed mid century touches. Metal cabinets are the creme de la creme of mid century kitchen design. People drive cross-country to rescue original metal cabinets from homes being renovated—and for good reason. These beauties epitomize the era’s dedication to innovation through design. Luckily for you, they are available new and in a variety of sizes and colors. Follow Atomic Ranch on Instagram to stay updated on our newest posts!